This review is spoilerific. If you intend to play this game and take in its full impact, come back later. 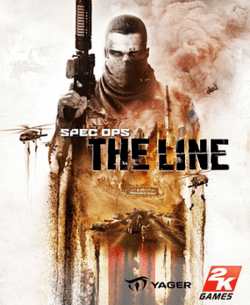 Spec Ops: The Line is a game about games. If Journey was the most spiritual game I’ve ever played, Spec Ops: The Line is definitely the most intellectual. It is a self-reflexive critique of violence in video games and a demythologization of the military shooter, achieving meaning by existing as a violent video game itself. This game is in no way, shape, or form, meant to be taken as an escapist fantasy into a fantastical world, but rather as a mirror to be used for self-reflection. There are two ways to read Spec Ops: The Line: as a game, and as a metaphorical art piece. As a game, Spec Ops isn’t very good. The simple combat, while functional and smooth, feels indescribably lacking, failing to evolve over the course of the game and growing repetitive by the end of the first few levels. That said, if read as an art piece, Spec Ops’ gameplay deficiencies are an integral part of its thematic and narrative meaning, making it one of the most important games of the year. If I am to use language from my film studies class, Spec Ops: The Line can be described as a uniquely modernist shooter, exhibiting an “alternative gaming” attitude that disregards commercialization. It takes a multitude of experimental risks to ask an uneasy question of its players: “Aren’t you all a little fucked up to enjoy all this violence?”. It exists as a darkly cynical subversion of the military shooter, a critique of video-game violence, and a prompt for introspection on part of its players. Spec Ops: The Line is highly self-aware and willingly goes against the cultural norms maintained by games as a whole. There are four ways that Spec Ops conveys its message, through its fixed narrative, its visual design, its gameplay, and its subversion of player expectations. As Spec Ops’ story is surrealistic and open-ended, players will leave with their own interpretations of what happens in the game’s campaign. The game begins in media res with Captain Walker making a daring escape from a ruined Dubai whilst being chased by helicopters, a mysterious sandstorm comes out of nowhere and crashes his team’s vehicle. The game then implicitly cuts back to several hours ago, as Walker and his team are making an entrance into the ruined city to evacuate Colonel John Konrad and his 33rd Battalion, which entered the city six months ago and were never seen again. As they explore the city, it becomes apparent that the 33rd Battalion has become an occupying force, intimidating the locals into submission. Going against pleas to bring in a third party, Walker continues into the city, under the impression that the 33rd Battalion has been exploiting the citizens, he fires white phosphorus on them. When he discovers that innocent civilians, most notably a woman and her child, were among those killed in the attack, Walker blames Konrad and swears to take revenge on those who died, dedicating his existence to bringing him to justice. Walker obtains a radio to communicate with Konrad, exchanging taunts and threats throughout the course of the game. After a number of adventures, Walker arrives at Konrad’s tower to find him painting a scene of the white phosophorus strike. At first, Konrad seems as menacing and mysterious as he was throughout the entire game, until Walker discovers his desiccated corpse slouched on an office chair like a throne. Konrad existed only as a figment of Walker’s imagination, a traumatic hallucination to somehow scapegoat or justify the atrocities he committed and witnessed throughout the course of the game. In a fourth-wall smashing conclusion, Konrad’s projection manifests itself in front of Walker, telling him, and by extension the player, that he explicitly had the option of leaving Dubai and turning off the game, instead, he pushed on out of a misplaced desire to feel like a hero, oblivious to the abyssal gap between his intentions and the actual impact that he has on Dubai. The projection then raises a gun to Walker’s head and starts counting down. The player is then given the option to kill the projection or have Walker commit suicide. Over the course of the game, it becomes increasingly clear that Walker is suffering from hallucinations, or in some way, the events that one sees depicted onscreen are not real. In one memorable sequence, a heavy trooper seems to teleport throughout a destroyed shop, upon being shot, the trooper vanishes, revealing that it was only a store mannequin. At times, the world flashes into a hellish, fiery landscape, Konrad’s tower giving off a menacing glow. One popular interpretation of the game is that Walker died in the initial helicopter crash in the prologue, and the events of the game represent his experience in Purgatory. No matter your interpretation of the game’s events, it is evident that the game’s events are not realistic or intended to be perceived to be reality (whatever that means in the context of video games). Rather, the game’s narrative aims for surrealism, an irrational juxtaposition of gameplay and story to convey a message. Military shooters of all stripes aim for ultrarealism in both their graphical fidelity and their physical simulation of combat, ArmA, Call of Duty, Battlefield, the list goes on. Considering that Spec Ops goes against the grain of the shooter genre, it is subversive in both how its narrative is framed and the unreliable way that narrative is presented. The second way that Spec Ops demyths the military shooter comes out of its visual design. The game does this in two ways: in the overall surrealistic look of the game’s world and its pastiche of visual elements from other shooters. The famous Moon scene of The Legend of Zelda: Majora’s Mask loosely resembles Spec Ops‘s ruined Dubai. Light bounces surreally off sandy cliffs thousands of feet high, lending the world an eerie, dreamlike glow. 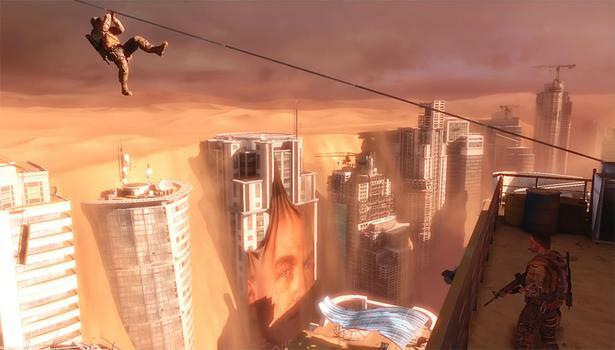 Thirty story buildings are buried underneath many tons of sand, necessitating a large number of rappels as the player descends deeper into the city. Reality and Walker’s subconscious projections continuously intermingle throughout the course of the campaign: did you see that white stag run off into the distance? Wasn’t that dead tree rife with green just a moment ago? Did the face on the billboard just change? The game’s visual surrealism accents Spec Ops‘s critique of how military shooters aspire to achieve realism. More obvious however, is Spec Ops‘ pastiche of visual tropes common to military shooters. This is especially evident in the game’s second act as Walker approaches and ascends Konrad’s imposing tower at the center of the city. This plays off a visual trope common to works from Lord of the Rings to Half Life 2 to Journey: the hero’s Odyssey towards his ultimate goal visible in the distance, the build-up towards the final confrontation in the villain’s imposing citadel. Spec Ops upholds this visual trope by having the citadel tower over the player as a visible goal for the latter half of the game, even going so far to have the tower glow ominously like the Eye of Sauron in one hallucinatory sequence. When the player finally arrives there, this trope is subverted. There is no final battle. The nine surviving members of the 33rd Battalion line up and simply surrender Dubai to Walker. After a short elevator ride to the villain’s lair, Walker discovers that his enemy was imaginary and commits suicide. If the whole “villain’s citadel” trope is intended to build up towards a “storming the castle” moment, then Spec Ops effectively subverts this trope by removing any element of oppositional violence from this concluding sequence. All this becomes more interesting when we consider that Spec Ops‘s final moments mockingly parody the final battle of Call of Duty: Modern Warfare 3. In Modern Warfare 3, Captain Price assaults a luxury hotel in Dubai to hunt down Makarov in hopes of avenging his friend Soap. Both of these sequences are structurally identical to each other, revolving around a confrontation with the enemy’s remaining forces in the lobby, a climactic ascent in an elevator, and an epic final clash with the enemy on the tower’s roof. Spec Ops condescendingly mocks Call of Duty by maintaining an identical visual structure but removing all the bombast. While Modern Warfare 3‘s final sequence features a challenging shootout with the remnant’s of Makarov’s forces as they make their last stand, the remnants of Konrad’s army simply surrender to Walker. While the elevator ascent in Modern Warfare 3 featured a battle with a helicopter and a striking backdrop of Dubai, the elevator ascent in Spec Ops is brief, quiet, and uneventful. The final confrontation with the antagonist in Modern Warfare 3 ends with Price overcoming Makarov and avenging Soap, while Spec Ops ends with the Walker’s death. This derisive imitation of a successful military shooter accents Spec Ops’ condescending tone towards the genre as a whole. The most daring subversion the game makes comes out of the mundanity of its combat. This game gets repetitive quickly and contains gameplay warts such as respawning enemies and a dearth of weapon variety that would have been acceptable five years ago. The only gameplay evolution seen throughout the course of the campaign is a substantial escalation in the brutality of the execution moves, otherwise, Spec Ops’s gameplay stays the same throughout the entirety of its narrative. This is all done purposefully though, as it brings into question the player’s motives for playing the game. If the gunplay is repetitive and fails to evolve, what reason does the player have to continue playing except to watch increasingly grisly executions? The game’s ending proposes that Walker had eschewed the choice to leave Dubai, thereby implying that to stop playing the game midway through was a legitimate ending that players could choose. This is where Spec Ops moves its metaphorical crosshairs from the military shooter genre to the player him/herself. If our participation in the game’s world will inevitably lead to its further destruction, what motive do we as players have to continue playing? The game does not reward continued play with new gameplay mechanics and the game’s plot grows increasingly hostile and depressing as it progresses. Why would we want to play until the end? This question is answered in Konrad’s final monologue, where he addresses the player directly: “You’re here because you wanted to feel like something you’re not: a hero”. In one elegant swoop, Spec Ops challenges our acceptance of violence in video games, going against everything that we’ve come to expect from this medium. By now, it goes without saying that Spec Ops demythologizes the military shooter and questions fundamental precepts of the interactive medium. The final, and most brutal, method that Spec Ops utilizes to achieve meaning is by its subversion of player expectations. During its ad campaign, 2K and Yager attempted to depict the game as a generic military shooter, and given the game’s unfortunate title, promotional trailers, and boxart, it effectively disguises itself as a crappy knockoff of much better games. For its opening chapters, Spec Ops effectively holds this guise, the opening chapters are rife with poorly written dialogue and Walker and his crew seem to be no more than cardboard cutouts of Gears of War characters. The first few levels are intended to leave a bad impression on the player, initially leading them to question why they bought the game and why they’d continue playing in light of much better games like the aforementioned Gears. All this makes the game’s attack on the player’s motives all the more devastating. Perhaps the most interesting scene where player expectations are subverted comes during the aforementioned white phosphorus scene. When Walker and his team are searching for a group of civilians held by the 33rd Battalion, they come across a large number of guards patrolling a courtyard. Walker finds a mortar loaded with white phosphorus rounds, and uses it to clear the area. In order to facilitate better aiming, he launches a camera into the sky and operates the mortar from a computer. At this point, the game transitions to a black & white birds-eye view reminiscent of the AC-130 level from Call of Duty 4. Having being trained by similar games, the player is subconsciously led to want a high bodycount and feel a sense of excitement and gratification when s/he sees an explosive vehicle or a large group of enemies bunched up together to make the next victim of an aerial strike. Imagine the excitement the player would experience when he sees a group of 30-40 guys bunched up together. Trained by other games to view this as a good thing, the player pulls the trigger and fires an air strike. Which leads to perhaps Spec Ops‘ most shocking and uncomfortable moment. That large group of “enemies” bunched up together that you saw from the bird-eye view? Those were the civilians that you were trying to liberate. The 33rd Battalion perceived you as a threat and brought them here to protect them from you. Knowing player’s expectations from the genre, Spec Ops is conscious of what players expect as positive and negative feedback, making the revelation that they just caused great harm in the game’s world that much more devastating. Spec Ops is a game that anyone interested in the art-game movement should play. It is in no way, shape, or form, a happy game, and most players will come out of it feeling awful. But there’s no denying that this game is important. For a game to critique its own genre, medium, and audience shows that games have matured substantially, and Spec Ops uses the uniqueness of the interactive medium in unique and effective ways. My high-school theology teacher once said to me that evil appears when people and institutions fail to question themselves. While Spec Ops’ harsh indictment of such a foundational principle as simulated conflict in video games is unsettling and uncomfortable, it is necessary as video games mature. If Spec Ops, Journey, The Walking Dead, FTL, The Unfinished Swan, and Hotline Miami are a sign of things to come in gaming’s future, we’re all in for one hell of a ride.